Do you have a story about how you found or connected with someone online? Here's my story of an encounter I made via Google Search, email and Facebook. As my followers know, I paint about little chunks of humanity throughout the Philadelphia area. A few months ago I had in my head to paint a series of street musicians. As usual I visited the various parks of Philly looking for subjects to photograph. I took a bunch of photos but I just was not happy with anything. So I went online searching for "buskers of Philly" images to get ideas about how to better capture my subject. I found a website with awesome images by photographer Jonathan Yu. I made a little painted sketch and really loved where it was going. But... this was not my reference photo, so I researched how to get in contact with the photographer. I found his website and emailed him requesting permission to use his photo as reference for my painting. I mentioned in the email that if I did not hear back from him I would not continue with the painting. I did not hear from the photographer, so the little painted sketch remained unfinished. One recent day while checking my artist FB Page - I notice a message awaiting in my inbox. And here is where this story gets crazy! The message is from the musician in Jonathan Yu's photograph! The street musician is a friend of the photographer . 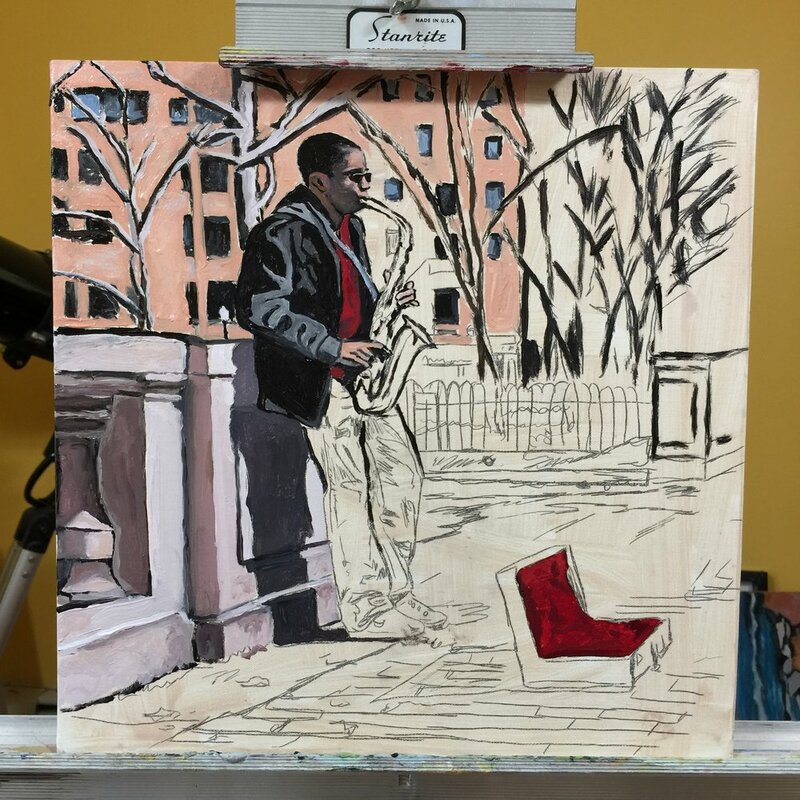 The photographer contacted the musician and sent him the image of my unfinished painting. Turns out, when the musician learned about the painting - he researched me and discovered my work online by way of my website, Instagram and my Facebook Page! The musician contacted me through the Facebook Page, tells me he loves my work and asked if the painting is available for purchase! How crazy & exciting is that!! I am making him a larger painting of the original sketch for him to purchase. It will be ready in about a month. We are both thrilled about the painting. He never had a painting of himself and I am thrilled about how art brings folks together in the craziest of ways! Do you have a crazy connection story? I'd love to hear it! If you haven't checked yet - click on my FB Page & Instagram account.